When the clashes started on March 19th, I was at the hospital. My house was just in front of where the clashes were taking place. I could only go home at nine in the evening, and when I arrived at home my wife and two children were in a state of panic as they were all alone. When the clashes started on March 19th, I was at the hospital. My house was just in front of where the clashes were taking place. I could only go home at nine in the evening, and when I arrived at home my wife and two children were in a state of panic as they were all alone. The clashes were heavy. I was facing a dilemma and didn’t know what to do the next day. Should I stay with them or go to the hospital? I was worried about them every time I went to the hospital. I didn’t want to leave them, but doing my job meant that I had to do. We received many mass casualties. My presence was necessary all the time as I had to provide the necessary materials from the pharmacy. Even though we are well prepared, the high number of injured meant that I had to run to the hospital pharmacy to bring more essential supplies for the doctors. We were working all day at the hospital, and when I would go home, it was not calm there either, as we would hear the sounds of gun shots. One day, as I was going to my home, which I had recently rented nearby and so I was not well known to everyone in the neighbourhood, I was stopped by some gunmen near my home and they pointed their guns at me. Then an old man recognized me and so they let me pass. After this incident I took my family to Abyan governorate where my relatives live. I felt that they would be okay there as there would be someone to take care of them. 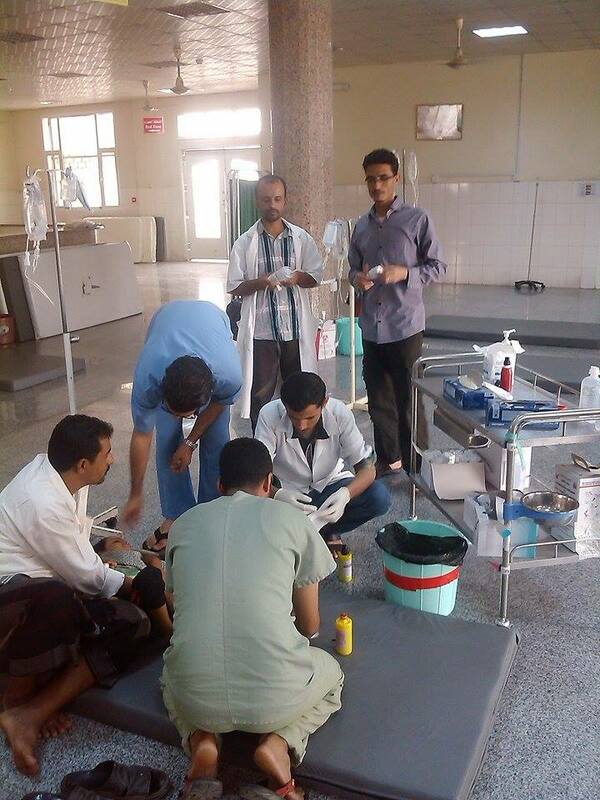 I was scared on the way back, but thankfully I arrived safely to Aden and I am now back at the hospital.